Image: California High-Speed Rail Authority. The California High-Speed Rail Authority (CHSRA) has released a revised business plan for building the nation’s first high-speed railway, with cost estimates rising by $13 billion (∼€10.5 billion). Plans detailed in 2016 stated that Phase 1 of the route between San Francisco and Los Angeles would cost around $64.2 billion (∼€52.1 billion) but this estimate has now risen to $77.3 billion (∼€62.7 billion). Planners have set a wider cost estimate range between $63.2 billion (∼€51.33 billion) and $98.1 billion (∼€79.67 billion), with funding planned to come from the federal government, the state government and the private sector in equal parts. 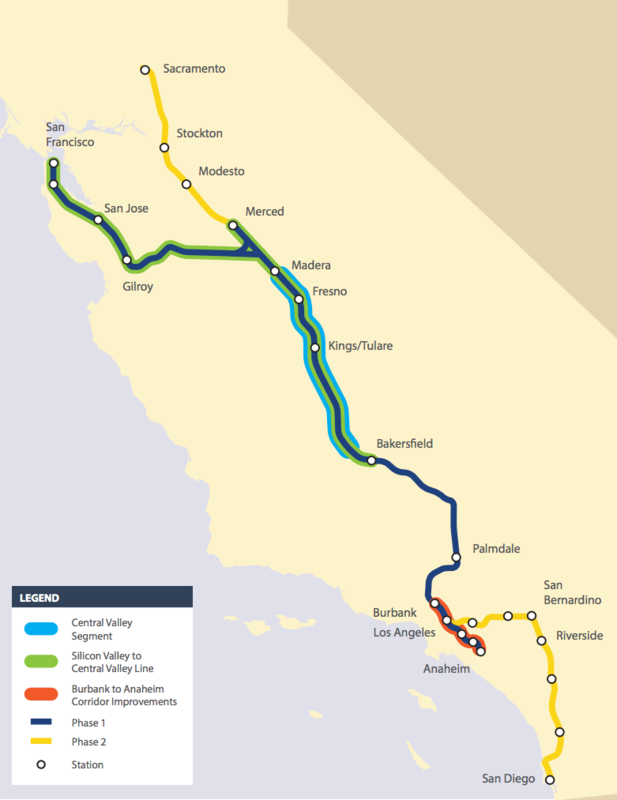 The new business plan also features a revised schedule, pushing back the proposed 2029 opening of Phase 1 in full to 2033 and the Silicon Valley to Central Valley line (highlighted below in green) by 2029, later than the earlier prediction of 2025. Photo: California High-Speed Rail Authority. CHSRA, which is responsible for planning, designing, building and operating the high-speed line, said the longer schedules and higher costs are down “in large part to inflation, increased contingencies and construction delays in the Central Valley”. CEO Brian Kelly, who started in his new role in February, said: “The Draft 2018 Business Plan presents a strategy to implement the nation’s first truly high-speed rail system in the face of challenges that projects around the world of similar magnitude and complexity have faced and successfully overcome. Currently there are 20 active construction sites for the high-speed railway. CHSRA estimates that already there has been an economic boost of up to $6 billion as a result of the early works. Once it is complete, the high-speed line will run from San Francisco to the Los Angeles basin in under three hours at speeds capable of exceeding 200mph. The system will eventually extend to Sacramento and San Diego, totalling 800 miles with up to 24 stations.